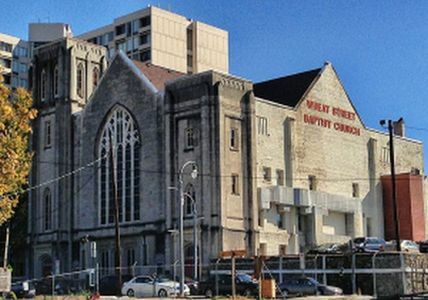 Along with its neighbors Ebenezer Baptist and Big Bethel AME, Wheat Street Baptist Church has been a major contributor to the social, economic, and cultural fabric of Atlanta, Georgia, particularly within its African American community. A group of parishioners from First Baptist Church founded Wheat Street Baptist in 1869, wanting a church in closer proximity to their neighborhood. With the permission of their pastor at First Baptist, they organized Mt. Pleasant Baptist Church on Howell Street, naming Rev. Andrew Jackson as their first leader. The church moved to its current location in the early 1920s, after the fire of 1917 wiped out its previous building. Rev. Peter James Bryant and the Wheat Street community built a new church in the gothic revival style, with a main auditorium that seats 2,500 people. Many people considered Wheat Street Baptist an elite institution in the late nineteenth and early twentieth centuries. Its parishioners of high wealth certainly added to this image. But, like many churches, its social mission remained paramount. After the Civil War, Wheat Street ran a home for elderly women, a school for laborers, and even hosted cultural events and entertainment productions. The church also ran institutions like the Butler Street YMCA out of its basement in the late nineteenth century, a common practice among African American churches. The Sweet Auburn District, once a thriving center of African American entrepreneurism, faced blight in the mid-twentieth century when freeway construction cut the neighborhood in two. However, Wheat Street Baptist continued to pursue innovative strategies to support its community. It established one of the first African American church credit unions in 1956 and later started the Wheat Street Charitable Foundation, which hosts a housing ministry with affordable rental and single-family homes. Wheat Street has been a catalyst for economic development. It owns two shopping centers and by 1999 had over $33 million in real estate holdings, making it one of the wealthiest African American churches in the United States. Wheat Street’s pastors have been active in politics, education, and civil rights struggles since its founding. For instance, Rev. William Holmes Borders, who presided over the church from 1937 to 1988, worked to desegregate Atlanta’s public transportation system in 1957. Wheat Street has had only six pastors since its founding in 1869: Rev. Andrew Jackson (pastor 1869-1874), Rev. William Henry Tillman (pastor 1875-1897), Rev. Peter James Bryant (pastor 1898-1929), Rev. J. Raymond Henderson (pastor 1930-1937), Rev. William Holmes Borders, Sr. (pastor 1937-1988), and Rev. Dr. Michael Neely Harris (pastor 1989-present). Wheat Street Baptist is still active at 359 Auburn Avenue in Atlanta’s Historic Sweet Auburn District near the Martin Luther King, Jr. National Historical Site. Atlanta’s new streetcar will pass right by its bright red doorways. Andrew Billingsley, Mighty Like a River: The Black Church and Social Reform (New York: Oxford University Press, 1999); Tera W. Hunter, To ‘Joy My Freedom: Southern Black Women’s Lives and Labors After the Civil War (Cambridge, MA: Harvard University Press, 1997); Wheat Street Baptist Church.